Molten lava, toxic gas and plumes of ash have been spewing out of Hawaii’s volatile Kilauea volcano since it began erupting in early May. But more recently, the sight of green 'gemstones' around the volcano site has caught residents by surprise. Known as olivine, the green minerals have been found near lava flows, causing wonder and puzzlement for locals. However, reports of them raining down from the skies are wide of the mark says Wendy Stovall, a U.S. Geological Survey (USGS) volcanologist. 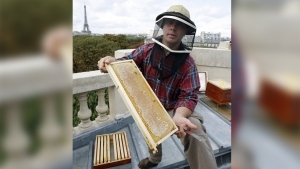 “We have no proof of that happening from our scientists on the ground. If you look at the images of the olivine that have been reported, the crystal are very rounded. They look like they came from a lava flow, rather than crystals shooting out of the volcano as it’s erupting lava,” she told CTVNews.ca in a phone interview. Erik Klemetti, associate professor of geosciences at Denison University in Ohio, explained how the shiny, green crystals form. 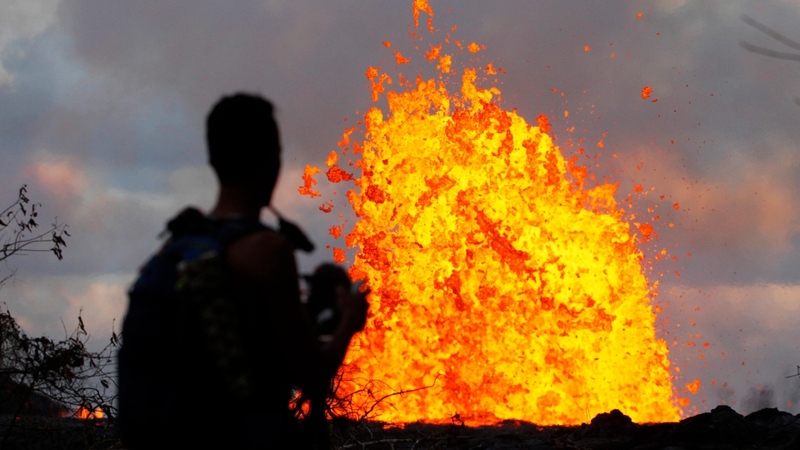 “The first thing is that lava cools, even before it makes it to the surface,” Klemetti said. “When magma cools the first mineral that crystallizes is olivine. So typically if you pick up any chunk of Hawaiian lava at the surface, it’ll have olivine crystals in it. “You’re taking the pre-existing chunks of rocks that are being shattered by the explosions and you liberate those crystals from that solid rock and you get these lovely, little olivine crystals that are part of the ash and debris that are deposited,” he said. Klemetti said the presence of olivine at Kilauea eruptions is not uncommon. Klemetti said the liberated olivine grains are easy to spot among the materials coming out of the volcano. “They stand out because you’re looking at a pile of ash and debris, which is all grey and black, and then you have these big, green crystals. They certainly stand out in the crowd,” he said. And Kilauea isn’t the only part of Hawaii where you’ll find the crystal. Hawaii’s famous Papakolea Beach, known for its green sand, gets its colouring from olivine. The mineral is also used in jewelry, more commonly referred to as peridot. 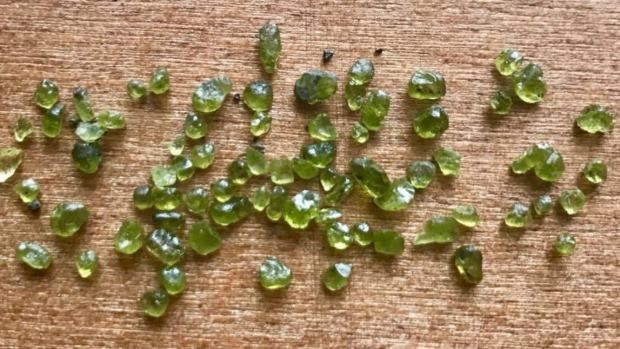 “You can get jewelry that has peridot crystals, but they’re usually larger than the ones they’re getting at Kilauea,” Klemetti said.